FXTM published a piece last week highlighting the severity of the gender pay gap in Europe, with a slight difference – they compared it to the price of a beer. August 2018 –uk releases a report that exposes the gender pay gap statistics of over 10,667 UK companies. Some of the results are shocking. One lingerie company even reports that its female employees are earning as much as 75.7% less per hour (on a median basis) than its male colleagues. 11th September – news outlets announce that Deloitte has reduced their gender pay gap to 41.1%, but its bonus gap widens. 12th September – Financial times reports ‘government refuses to change gender pay gap rules’. 12th September – The Telegraph releases a story claiming the 12th September to be ‘Mums’ Equal Pay Day’, marking the day working mums technically start working for free. 14th September – London Loves Business issues a story stating ‘Most Brits have the wrong idea of what the gender pay gap is’. Yet, all this information on the gender pay gap in Europe is a little overwhelming and confusing – especially as the statistics are often referring to those in much higher corporate roles than we can relate to (or are BBC celebrities). FXTM have taken it back to basics. Firstly, what would we have to charge men to make the price of everyday items in the UK an equal cost? And secondly, what does the UK gender pay gap look like when you apply it to the price of a beer? Using data from the March 2018 Eurostat report, FXTM also applied this hypothesis to the gender pay gap across Europe. The UK places only above Germany (21.5%), Czech Republic (21.8%) and Estonia (25.3%) in the gender pay gap table. Romania has the smallest pay gap in Europe (5.2%), with Italy (5.3%), Luxembourg (5.5%), Belgium (6.1%) and Poland (7.2%) making up the rest of the top 5. Estonia: has the largest gender pay gap in Europe – 30%. If you apply that to a cost of a beer, men would technically have to pay 75 cent more per beer to make the price equal. Estonia: women in Estonia technically start ‘working for free’ from the 29th September. This equates to 93 days where men are getting paid and women aren’t. UK: For those who LOVE their takeaway latte from Starbucks in the morning, men would have to pay an average of 60p more per latte. 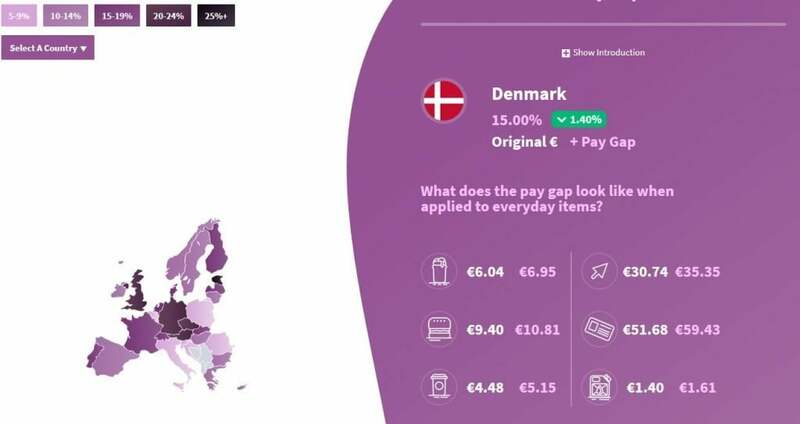 Poland: despite being one of the countries with the lowest gender pay gap, their pay gap has actually increased by 1.7% over the last five years. In Europe, the UK is ranked in the bottom ten (4th worst) for its gender pay gap of 21 percent. This means women are effectively paying 21 percent more whenever they splash their cash. We also shouldn’t ignore those who have the lowest gender pay gap in Europe as men are still earning money for an extra 20 days a YEAR than women. What Does it Look Like for Future Generations? There is no doubt that the spotlight placed over gender pay gap in Europe has caught the attention of corporate giants. However, research has highlighted that the millennial generation are still experiencing the gender pay gap as soon as they start their first job outside of university, and this is expected to widen as they work their way up the career ladder. We have displayed all this data in the interactive heatmap here.